CORRECTLY ALIGNING YOUR ANTENNA HAS NEVER BEEN SO EASY! We are the main European distributor of the innovative and easy to use Smart Aligner tool from Multiwave Sensors Inc. Featuring a compact design, multiple configurations, incredible performance and smart phone connectivity for quick and simple measurements, verifications and reporting while on the move, the Smart Aligner tool is the most powerful and trusted antenna alignment tool on the market. With 18 antenna mounting positions and incorporated GPS technology and sensors to calculate Azimuth, Tilt, Roll, Location and AGL, even the most demanding spatial and RF conditions do not present a challenge for the Smart Aligner. Call us today on +44(0)7809 246943 to discuss our Smart Aligner products and how they will make a huge difference to the way you align your antennas. Automatically calculating Azimuth, Tilt and Roll offsets for any configuration, the Smart Aligner is the most powerful and easy to use antenna alignment tool on the market. 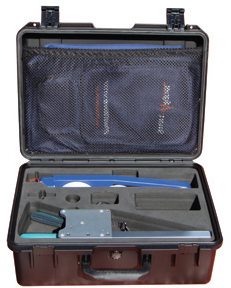 Weighing only eight pounds, able to be packed into the provided backpack for easy transport and supplied with additional brackets if required, the Smart Aligner tool is the obvious choice for telecommunications companies worldwide. With a typical 0.5° degree Azimuth accuracy, GLONASS for increased performance, enhanced RF shielding and a fast acquisition time and a tilt and roll accuracy of 0.2°, the Smart Aligner tool makes it quick and easy for you to accurately measure and amend the alignment data to ensure continually stunning performance. Simply download the Smart Aligner app for your iOS or Android phone or tablet and have immediate access to accurate measurements and important alignment data. You will then be able to import and export site data directly to and from the app, take and include up to four photos for each antenna in the report and create and send PDF reports wirelessly from your device. Operating throughout the UK, Europe and the rest of the world, we are one of the leading distributors and suppliers of Multiwave Sensors Inc.’s Smart Aligner tool. Contact us today to discuss your antenna alignment requirements with one of our expert team.